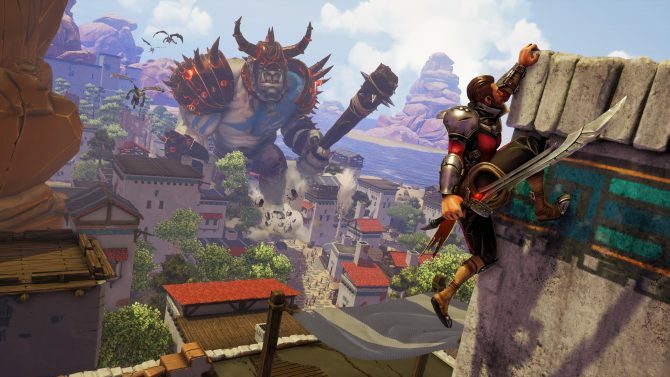 On June 1, Chicago-based developer Iron Galaxy and publisher Maximum Games unveiled Extinction, a unique action-adventure game where players must take on giant ogre-like creatures called Ravenii as Avil, the last of a group of warriors known as Sentinels that were supposed to defend the game’s world from the Ravenii, but failed. During E3 2017, I got the chance to meet up with the game’s developers, who played an early build of Extinction. 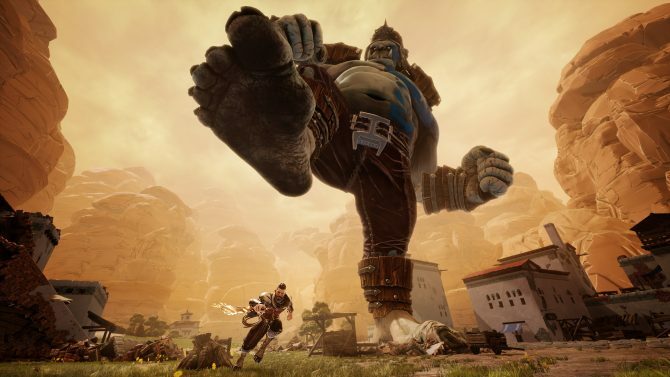 Afterwards, I got the chance to sit down and talk with Derek Neal, the Executive Producer of Extinction from Maximum Games, about all that Extinction has to offer, comparisons made between the game and Attack on Titan, and a possible release on the Nintendo Switch. Tomas Franzese: For those who don’t know about Extinction, could you give them a quick overview of the game? Derek Neal: First of all, my name is Derek Neal – I’m the Executive Producer at Maximum Games, and Extinction is set in a fantasy, medieval world that has been invaded by these enormous 150 foot monsters called the Ravenii. They have begun systematically wiping humanity off of the face of the planet, and it’s your job to stop them. The main character, Avil, is out to save as much of humanity as he can; his victories are measured in lives saved. TF: Extinction is quite different from many of the games that Iron Galaxy has made before (i.e. Killer Instinct). How did Iron Galaxy Studios first conceive the idea for Extinction? DN: One of the interesting things about games that involve giant monsters of the 150 foot variety is that, by and large, you don’t actually get to fight them. There is some kind of abstraction you are doing instead of fighting them. For example – maybe they have an HP bar, and you select an attack from a menu and eventually their HP reaches zero and they fall over dead; or, maybe it is a quick time event where there are a bunch of cool pre-rendered cutscenes, but you are basically just pressing a button to keep going every now and then. What we really wanted to prove was that it didn’t have to be that way. That you could actually have – just like in a fighting game – real-time, skill-based combat, but on these massive scales. We wanted to take that skill set – that experience that we built up doing those fighting games – and prove that it could be applied to these other arenas as well. The main character, Avil, is out to save as much of humanity as he can; his victories are measured in lives saved. TF: How do you feel about the Attack on Titan comparisons being made with Extinction? DN: Honestly, we’re flattered by it. I think it’s awesome that people compare us to Attack on Titan. It’s a well-beloved brand; obviously people really enjoy it. Our game is its own thing, and we are trying to go our own direction with it, and we’ll be announcing lots of stuff that will help people see the differentiation between the brands in the future as well. It makes us happy to see people talking about it in the same vain as things like that. TF: What was your biggest influence on the game’s art style? DN: Actually, it was the environments of Yemen. So if you go and look up Google images for Yemen, you’ll see that there are these big mountains in the background; these closely huddled together cities full of square buildings and things like that, these brown and warm tones that are all over everything. There are these bright dots of color wherever there is vegetation, and these really bright green trees, and these really bright bushes that are laid out in these areas. We really wanted a place that made sense as a battle arena for fighting these giant monsters, so the mountainous regions we were looking at really made sense in terms of being able to bound the levels, and also the really tall buildings that were kind of nestled among the mountains. The things up on plateaus like that made sense with the verticality we were looking for; the sense of something that you can climb on that might be tall enough for what you actually interact with. The more and more we looked into it, the more we decided that that would be a good direction to take it. TF: Each encounter in Extinction seems quite dynamic. How hard is it to create a good balance between ogre-slaying, platforming and helping villagers while taking on smaller enemies? DN: The short answer is that we didn’t. 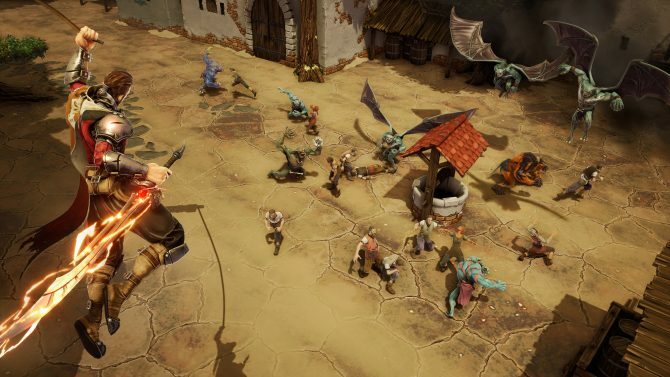 The game is mission-based, and different missions have more or less emphasis on different pieces of that sort of stuff, depending on what your goals for a particular mission are; you might be going out ogre slaying or you might be saving people from minions, or trying to keep the ogres away from a particular thing. Or, you’ll be trying to protect a valuable building, or trying to gather certain resources: that sort of thing. Because every mission has its own set of objectives and secondary objectives as well, the different ways of playing the game and different styles you alluded to get emphasized in different ways across the course of the campaign. TF: How prevalent is Extinction‘s narrative? Are there going to be important choices the player has to make that could have different effects on the story? DN: The story itself is a single narrative story, it doesn’t branch in terms of what happens in the overarching story of the game; however, the missions themselves are very dynamic, and they’ll change very significantly depending on how you choose to play through them. For example: let’s say that ogres are coming from both sides of the given city. There is terrain, people, and elements of the mission that will be very different if you choose to go for the left ogre versus the right ogre. The watchtower that you use to get up there may have been destroyed by the time you get over there if you play it the other way. All of those people may be dead, so you have to find a different thing to do. Maybe you have to lure [the ogre] over to this terrain feature where you could scamper up it, or maybe you have to try to plow through his armor to actually take down his legs and stop him from being able to get through so you can make use of a hill that is not as tall. So every time you play through – depending on what you choose to prioritize – you’ll have different success with the mission objectives, the secondary objectives, and the mission itself will unfold in a very different way depending on how you made those choices. TF: Can the main character unlock new special abilities as the game progress besides what we saw in the demo? DN: Absolutely. So, there is a skill tree that we’re not giving a lot of details about right now. But as you play play through the campaign, you gain skill points that you can use in order to evolve and grow Avil, and get him new skills, make his skills better, and take him down different paths. For example, tower-based or speed-based or technique-based skills, that sort of thing. Different players who play through will have different builds that they can use. TF: Could you go over some of the different modes in Extinction? DN: In addition to the main campaign mode, and then all the side quests to it that unlock as you play through, we also have Daily Challenge mode, which is where everyday there is going to be a brand new mission for you to play; there’s leaderboards and things associated with that. There’s also Extinction mode, which is our endless horde mode where the ogre just keep coming and you have an objective to defend so success is based on how long you can hold out. And then there is Custom Battle mode, where you can spin up a quick custom map and then share it with your friends. We will have more details on all of those things as our game progresses. 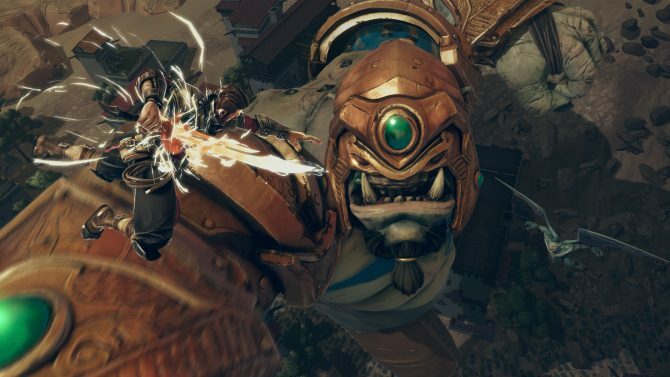 TF: Will Extinction feature enhancements on PS4 Pro and Xbox One X, and could you go into what those improvement are? DN: Stay tuned for more information on that is all I can tell you, right now. Every time you play through – depending on what you choose to prioritize – you’ll have different success with the mission objectives, the secondary objectives, and the mission itself will unfold in a very different way depending on how you made those choices. TF: Has Iron Galaxy got the chance to work on/with the Nintendo Switch yet? Do you have plans to bring Extinction or any of Iron Galaxy’s games to that platform? DN: I’m not myself a member of Iron Galaxy, but to speak for them – I believe they have, yes, been involved directly with some Switch development. As far as Extinction, it wasn’t part of our original plan to bring Extinction to the Switch, but actually we’ve gotten this question a lot. A lot of people seem excited about the prospect of having this title on the Switch, so we are re-evaluating those options and seeing if maybe that is something we want to do. But, that decision hasn’t been made yet. TF: Is there anything else you would like to tell players before they get their hands on Extinction? DN: First of all, the game’s coming out early next year – so Q1 2018. All of our news updates and things get published on Extinction.com and @ExtinctionMG on Twitter, so those are good places to go to keep up to date on what’s going on. Extinction is currently set to launch on PS4, Xbox One, and PC in Q1 2018. Stay tuned for our upcoming hands-off preview of the game from E3 2017.